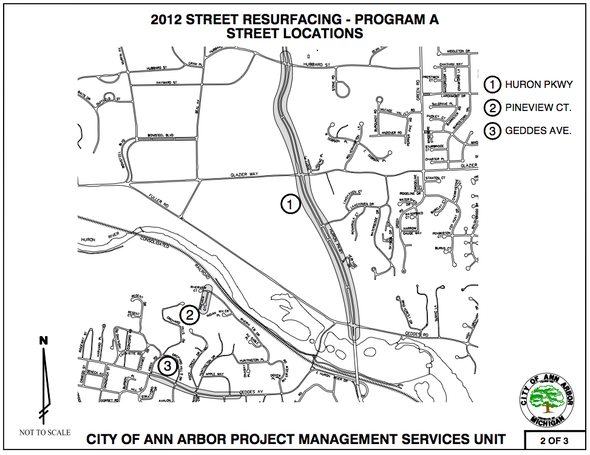 Posted on Tue, Apr 3, 2012 : 5:58 a.m.
With what Mayor John Hieftje called "a very heartfelt unanimous vote," the Ann Arbor City Council entered into a $3.6 million contract with Barrett Paving Monday night. 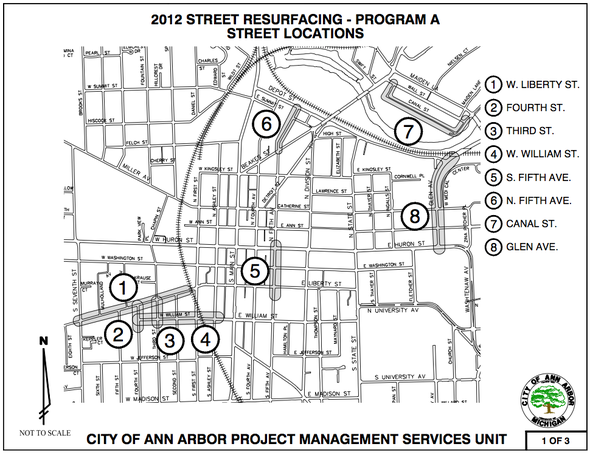 The council's action paves the way for the first of two large street resurfacing programs that will bring improvements to several city streets this summer. 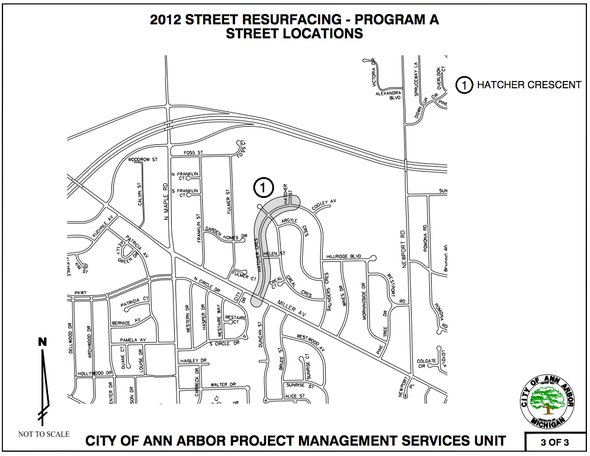 The work approved Monday night consists of resurfacing five major streets and eight local streets. Construction is scheduled to begin April 16 and be complete in October. Another 20 streets are expected to be resurfaced as part of a separate $4 million contract with Barrett Paving expected to come before council in two weeks. For all the streets, local access will be maintained throughout the construction, said Homayoon Pirooz, head of the city's project management unit. To allow for construction on the major streets, the number of traffic lanes will be reduced to allow construction on one half of the street at any time. Wed, Apr 4, 2012 : 1:03 a.m.
a survey truck was on my block for over an hour around 7pm tonight. I asked what he was doing, answer- surveying for a cross walk on David Ct. Why we would need one makes no sense to someone who has lived here for 49 years. And was the guy doing the survey getting time and a half at that time of the day. No one else was working on David Ct. at this time and why would it have taken that long? He said to call the city, though maybe the paper was a better place. Tue, Apr 3, 2012 : 6:25 p.m.
How about Eisenhower Pkwy from Ann Arbor-Saline to Boardwalk ? What a mess! Tue, Apr 3, 2012 : 4 p.m.
Technically, the 3.6 and 4.0 million dollar contracts will reduce the street millage fund by an additional $76,000 since 1% will be diverted to the &quot;1% for Art Fund&quot;. It bothers me that special millages I voted for (Street and also Sidewalk millages) have money diverted to a fund for which I never had a chance to vote. Tue, Apr 3, 2012 : 3 p.m. Funny how so many things are possible leading up to Mayor Hieftje needing reelection in November. We get roads, foot cops downtown for the summer, even the facade of discourse over the spending on public art. Wow. So. Amazing. Hieftje, ya still don't get my vote. It's time to move on to a non profit where you can waste money with no consequences. Tue, Apr 3, 2012 : 12:32 p.m.
Tue, Apr 3, 2012 : 6:28 p.m. I agree with you about repairs needed on Eisenhower Pkwy from State to Boardwalk (in fact from Ann Arbor-Saline to Boardwalk) but Leah Gunn is absolutely correct. Tue, Apr 3, 2012 : 1:10 p.m. Your criticism makes no sense whatsoever. Had they not waited for the federal money to repair the bridges, none of these street repairs would be happening, because the money that's now being spent on local streets would have been sucked up by the bridge project. 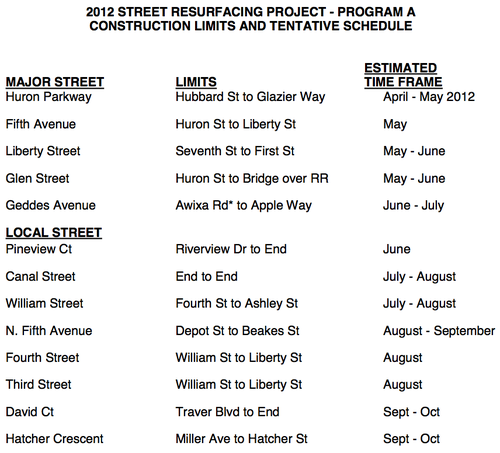 Yes, we had to wait a while, but now we get both the new bridges AND local street resurfacing. If they had followed your wishes, the bridges would done by now, but the local roads would be in even worse shape than they currently are, with no money available to repair them anytime soon. Is that really what you wanted? Or are you just so determined to oppose anything that Democrats do that you'd opt for a less desirable outcome just to make them look bad? If you recall, the city was saving its road millage money in case it had to use it to replace the Stadium bridges. Thanks to Cong. Dingell and MDOT, there has been about $24 million granted to the city, and the road millage can now be used for local street repair. It was a wise decision to wait. Tue, Apr 3, 2012 : 11:21 a.m. Wonders never cease! A2's roads slowly emerging from Third World status?